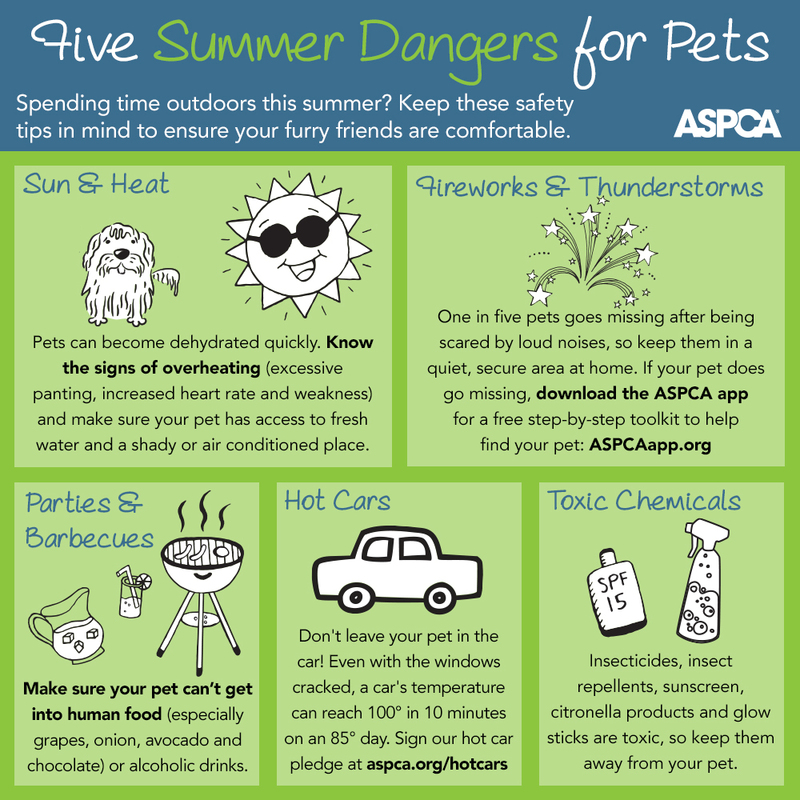 Summertime: Dangerous for Pets, so Be Prepared! For those of you in the Northern Hemisphere, it’s officially summer and it’s pretty darn hot! And even though you’ve been inundated with posts to social media telling you to take precautions, we still hear stories of people who unknowingly put their beloved pets at risk. So the good folks at the ASPCA are asking you to share this infographic far and wide. Let’s make this summer the safest ever for animals! Great Tips!!! We are in FL so it is super duper hot and the fireworks festivities will be starting this weekend and I am sure will be going til way past the 4th per usual 😉 Our Matt hates them and stays in his fort his human brother builds for him to keep him feeling safe and protected. I live in Florida too, and you’re right about it being HOT! Sadly, it’s not only animals that die in hot cars. A teacher at one of our local schools forgot and left her toddler in the car all day the last week of school. Yep, but nothing new, is it? I just hope the eye-catching design will catch the attention of someone who would otherwise not pay attention. Thank you so much for posting this, it’s so easy to overlook and our pets can’t tell us what’s wrong. Here in the UK we are in a mini heatwave and there is more to come next week. Luckily the town here is dog friendly and most of the shops have bowls of water outside which are replenished frequently. Maggie tends to go off her dinner if it’s too hot, but we always make sure she has plenty of fresh water and if she’s not interested, dampen her mouth/nose/face often. We both worry if she doesn’t drink and have recently introduced her to ice cubes! How sweet about the water! Just remember that dogs that share water bowls also share germs! If your dog is not well, be responsible and take your own water with you to keep other dogs safe! Good point, one that I shall remember, thank you. Maggie is actually quite fussy and if the water isn’t fresh (ie. she can’t see ‘bubbles’) she normally won’t touch it, and would rather have a drink out of a plastic sandwich bag (we used to buy 500 on a roll for £1 and use them for poo bags) from the bottle we buy. In hot weather, she comes first for a drink, then us. In the car, we always carry a clean bowl and fresh water for her. A timely reminder as UK is due a heat wave – we had 40 degree heat today here in Spain in the mountains and we are also in the middle of festivals with fireworks.. not a good time for pets or wildlife.. think about your four legged friends and keep them quiet and hydrated. Great advise for all pet owners lets hope they take heed! Everyone needs to see this; it’s common sense really, but we need to be reminded and this poster does the trick – as long as we act on it! Thanks for sharing. Going to re-blog on my site. Thanks Barb. It is common sense, and yet every July 5th animal control is overwhelmed with missing pets that got spooked by fireworks, dogs die in hot cars, and dogs eat food they aren’t supposed to. I know, some people just don’t get it, do they? That’s why reminders like this need to be constantly in their faces so that hopefully, the message might sink in. Great post Rumpy! Titan nor my hubs (PTSD) likes fireworks. Scares both of them. Passing this along! I don’t seem to mind fireworks, but our DeDe used to be very afraid of them. Terrific reminder graphic. I’m sharing on our FB page. It’s mind-numbing that we still have to remind people to not leave their pets in cars in he summer. WTH is wrong with people not to think?! This might be from the ASPCA but this is still valid here in the UK. I’m sure the RSPCA would agree with these points too. It’s dreadfully hot and humid. It’s against the law to leave a dog or child in a car here. Still, every summer some of both die. What are parents/owners/drivers in the stores thinking? It take so little time for a closed up car in the summer to bake the life out. Always a good reminder to put ourselves in their bodies. We tend to forget the dangers of our pets – thank you for sharing this article. Reblogged this on Veronica Blake, Writer. Thank you very much for reminding me this Rumpy! We have four cats here at home and they rarely go out but we often fireworks here in summertime, so we have to be careful it wouldn’t frighten them to run away from home. Good to have this reminder, now that the heat is here in force!